Kicking Off The Year WIth Newspaper Dancing! 1st and 2nd graders began the school year dancing and singing to a variety of styles of music while trying not to let our feet touch the floor! After defining "dance" and deciding on some ground rules for what counted as dancing (any type of controlled movement with our bodies), we opened our newspapers and stood on them. We discussed personal space and used our newspapers as a guide. After each song, we folded our newspapers in half again! The goal was to keep our feet on the paper and not on the floor while we danced. This activity was a big hit, especially as our newspapers got smaller and smaller until we were dancing on our tippy toes! The Adventures of Peer Gynt! 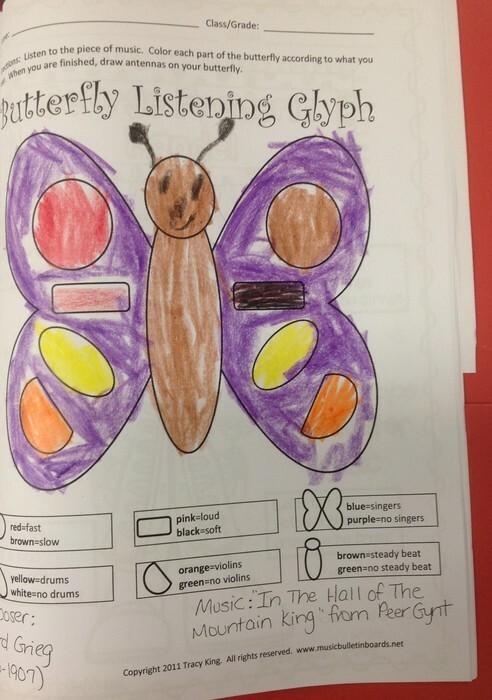 1st and 2nd graders had a blast learning about classical composer, Edvard Grieg. 1st graders learned that Edvard Grieg wrote "Peer Gynt: In the Hall of the Mountain King" involving a little boy named Peer who gets into some troubles of his own. The story introduced us to a boy named Peer Gynt who met trolls on his journey through the mountains. 1st graders experienced "tempo", or speed, and "presto" and "largo", our Italian terms for "fast" and "slow" as we listened to this classical piece by Edvard Grieg. Our new rhythm note in this song is the half note, which we performed, and drew in our music journals. We kept a steady beat, tapped and chanted rhythms, and even performed the story, complete with a troll king, some very angry troll guards, and a happy ending. But I won't spoil the surprise! I'll let your child tell you the story's ending! 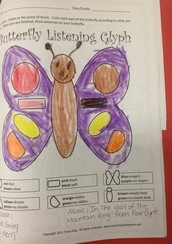 2nd graders listened to the piece, "Morning Mood," by Edvard Grieg, where we learned about the oboe and the flute and colored listening glyphs to show elements of music that we heard in the piece. We discovered that this popular piece is sometimes played in cartoons on tv! 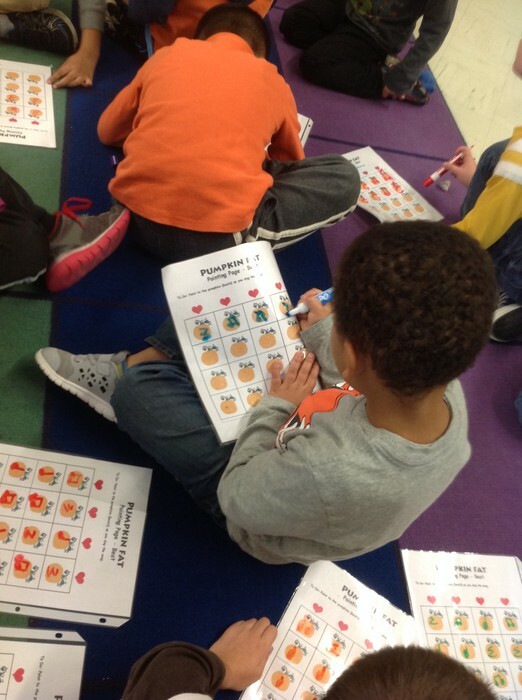 Kindergarten students practiced their pitch skills by learning the song, "Pumpkin Fat," sang the song on "sol," and "mi" notes, and practiced a steady beat. Students sang the song and made funny jack o lantern faces. They were then given the opportunity to play the xylophone while the class sang. Our final activity was to compose rhythm songs for our parters. 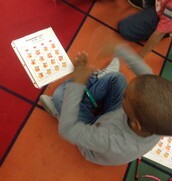 We had such a good time writing rhythms and performing them with our friends! You can even see pictures of our songs and us making funny jack o lantern faces hanging on the wall outside the music room! Click the link below to hear Ms. Lenihan's Kindergarten class singing, "Pumpkin, Pumpkin." 1st grade students learned the difference between major and minor sounds in music with the song, "Pass the Pumpkin," a spooky sounding song in a minor key. We passed the pumpkin around and took turns playing the xylophones, the cymbals, and even the rain stick! Kindergarten classes have been learning all about steady beats, and 1st and 2nd graders have been practicing their steady beats. Kindergarten students learned the rhyme "Hickory Dickory Dock" and the song, "Johnny Works With One Hammer," which had us laughing as we imitated Johnny's hammer by keeping a steady beat with our fists, our feet, and even our head! 1st graders learned the song, "Who's That Tapping At My Window," where they practiced a steady beat on the drum and the rhythm sticks and even sang alone for the class! 2nd graders learned the playground song and chant, "Down Down Baby" while practicing a steady beat, with foot and hand movements. They learned the difference between chanting and singing and had a lot of fun with this partner activity. All students will complete an interactive music journal highlighting for you some of the concepts that they have learned this school year. Journals are stored in the music room and will be sent home at the end of the school year. If you would like to look at the journals during the school year, they will be available during conferences. Our first memory song of the year was just in time for Halloween. We learned to chant and sing the song, "Mrs. White Had a Fright", and to read and write rhythms, including our new rhythm note, the half note! Once we had learned the song, we split into 4 groups with instruments and practiced ostinato patterns (patterns that repeat). One group performed on the triangle, one on the drums, one group played woodblocks, and the last group sang the song. We practiced reading music and following our parts while we played the song in 4 parts! We also learned to draw treble clefs and to write music! In our memory song, "Engine Engine", we sang and created trains that moved around the room. "Engine Engine" helped us to practice our "sol" and "mi" notes that we learned in Kindergarten. We did a great job clapping and writing the rhythms, singing and dictating the solfege and then writing the notes on the music staff for the first time! Our first memory song of the year, "We Are Dancing In the Forest," helped us to review our "sol", "mi" and "la" notes from 1st grade. We sang the song with solfege hand signs and played the singing game, which helped to reinforce the melody. We had fun pretending to be the trees and the wolf while we danced and sang "in the forest". Then, we read the song on the music staff and tried to outsmart the sneaky wolf who "swiped" notes from our song! We also learned new "tempo" (speed) musical terms in Italian and practiced using them in our songs. We reviewed, "Presto" and "Largo" from 1st grade and added, "Andante" and "Allegro" to our vocabulary. Our most current memory song, "Apple Tree" introduced us to our new note, "do". We learned the song by playing a game and keeping a steady beat on the xylophones. Once we had learned the song very well, we wrote the rhythms and solfege through dictation then we wrote the notation on the music staff! 2nd graders are getting very good at writing music. Just take a look at these examples! Listen to Mrs. Sullam's and Mrs. Donovan's 2nd grade music classes singing and playing the game, "Apple Tree" while keeping a steady beat on the xylophones. Just click the links below! Kindergarten students are doing a great job reading and writing rhythmic notation! We learned about quarter notes, eighth notes, and quarter rests. Students who read and played rhythms on the drum were sent home with a "Quarter Note King" or "Quarter Note Queen" badge for accurately performing a rhythmic line for the class. 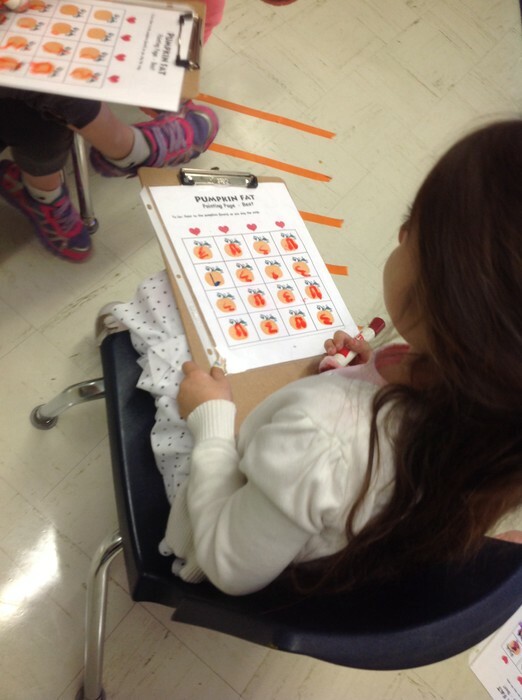 In the song, "Pumpkin Fat" we even learned to compose rhythms and to perform them with a friend! See the photos below! All students are learning to sing solfege while showing pitch placement with their Kodaly hand signs. 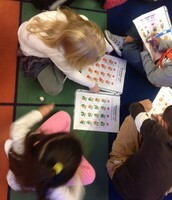 Even Kindergarten students are learning to sing all 8 notes of the solfege scale beginning on "do" and ending on "do." 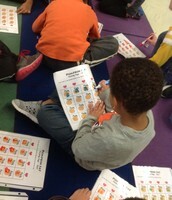 Each week, students volunteer to echo sing a solfege pattern for the class. We have super singers at Ravine Drive School! Click the link below to hear Mrs. Murray's, 2nd grade class narrating and practicing their headvoice with the warmup, "On A Dark And Stormy Night." Kindergarten students have been learning the concepts of loud and soft in music, with two versions of "If You're Happy and You Know It." 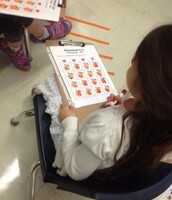 We also practiced using our 4 voices correctly, "speaking", "shouting", "singing" and "whisper". We practiced rhythms on rhythm sticks by tapping our names and counting the syllables. We also sang the song, "Jump In Jump Out" while we played rhythm sticks and had fun spinning the spinner to decide how we would perform our names while we played. 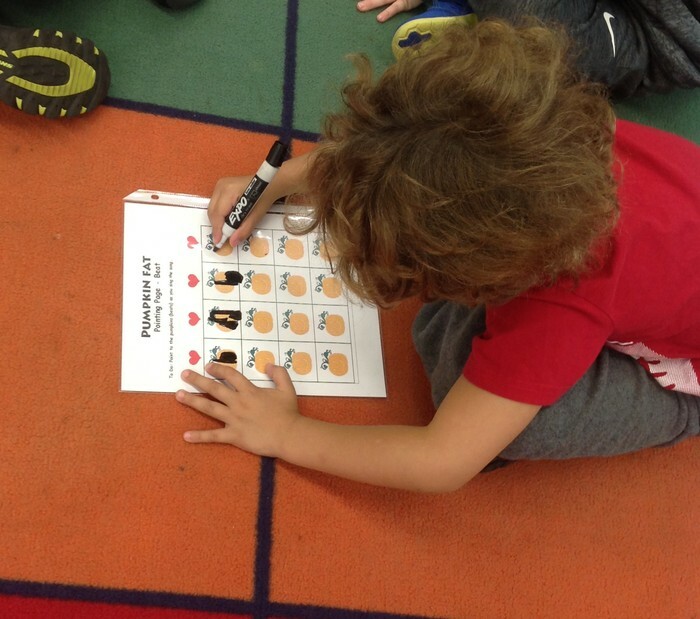 Kindergarteners are finishing up a unit on loud and soft by learning the song, "5 Fat Turkeys Are We" and playing the hide the turkey game while showing where the turkey is hiding by manipulating their voices loud and soft. This has been a favorite! 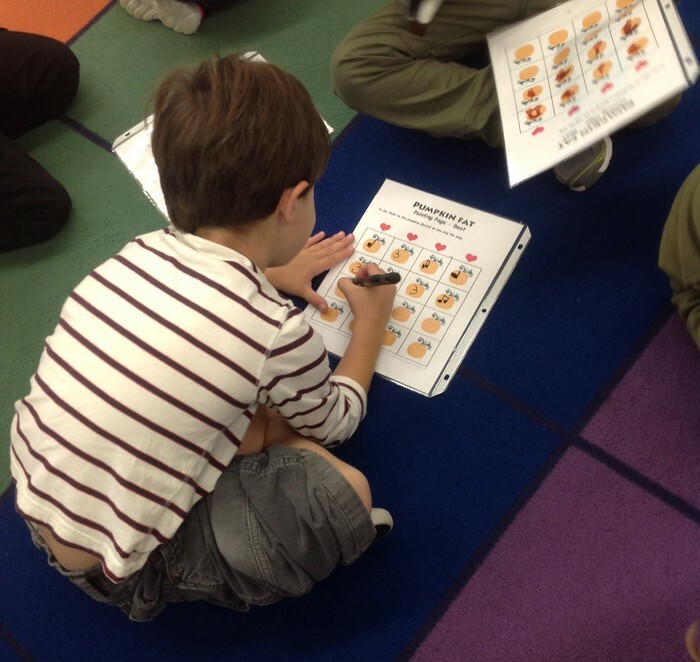 2nd graders have been working on notation reading and patterns in music by learning about notes that skip, step, or repeat. 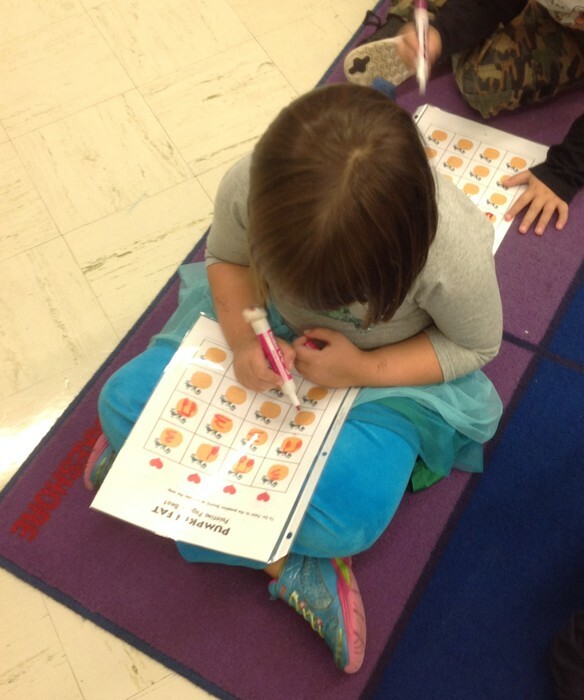 We practiced our skills with flashcards that we used to quiz, quiz, trade with a partner. 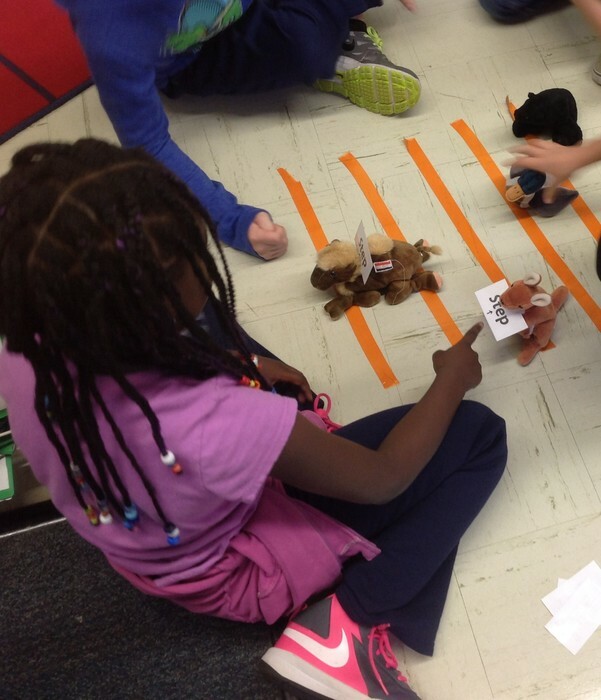 We practiced reading and singing skips, steps, and repeats using our solfege ladder, and raced beanie babies up the music staff using flashcards with our teams. Our November composer is Franz Joseph Haydn, a classical composer who wrote the song, "Surprise Symphony." Kindergarten, 1st, and 2nd grade students are having a great time learning about this composer, who liked to play tricks on people through his music. Students met Batty, my plush bat, who likes to sleep during the "piano" (soft) phrases in the music. But watch out! When the surprise hits, Batty is up and moving! Kindergarten students are practicing the concepts of "loud" and "soft", 1st graders learned the Italian musical terms "forte" and "piano" and 2nd graders reviewed "forte" and "piano" and learned about "mezzopiano" and "mezzoforte". Students enjoyed brainstorming "forte" and "piano" body movements and broke into two groups to perform their movements with Mr. Haydn's "Surprise Symphony." Kindergarten students also had fun being a conductor while the class performed on instruments. 3 groups of students played xylophones and rhythm instruments while the "conductor" stepped into the hula hoop assigned to the instrument group of their choice. It was fun stepping into two hula hoops at the same time and some very creative students even tried to step into all three at once! But be careful! If the conductor isn't standing in your hoop, don't get caught playing! The Ravine Drive 3rd Grade Chorus Concert will be held on January 28th, 2016. Students have been working hard to prepare 7 songs for you with the theme, "Finding My Place in The World." Each song sings of possibility and hope. 3rd graders are doing a great job learning their music. 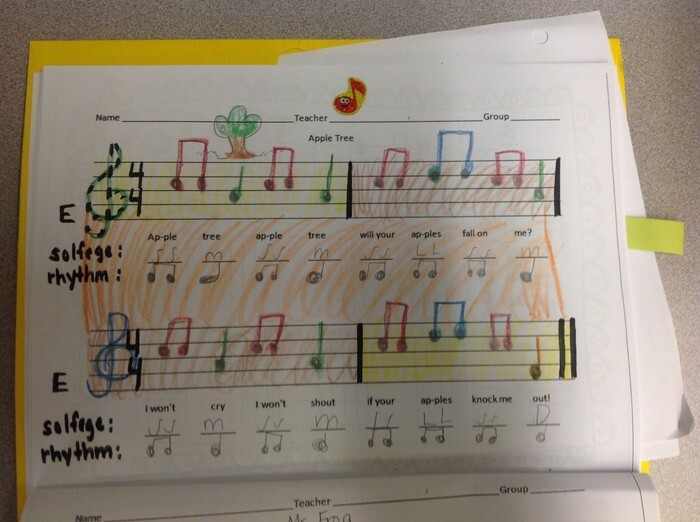 Students can continue to practice their music at home with the lyric sheet that was distributed to each student. There will be more information about concert times and attire as the performance nears. Ms. Terri Walliczek teaches vocal music and 2nd and 3rd grade computers at Ravine Drive School. Ms. Walliczek attended Mason Gross School of the Arts at Rutgers University as an undergraduate music major with a concentration in instrumental music education. Her specialty instrument is clarinet. Upon graduation, she moved to Florida where she attended Florida State University to complete a Master's in Music Education degree. 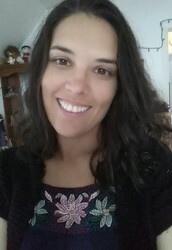 Ms. Walliczek is an avid Florida State Seminoles football fan, an accomplished photographer, voracious book reader, and enjoys traveling and creating new projects. 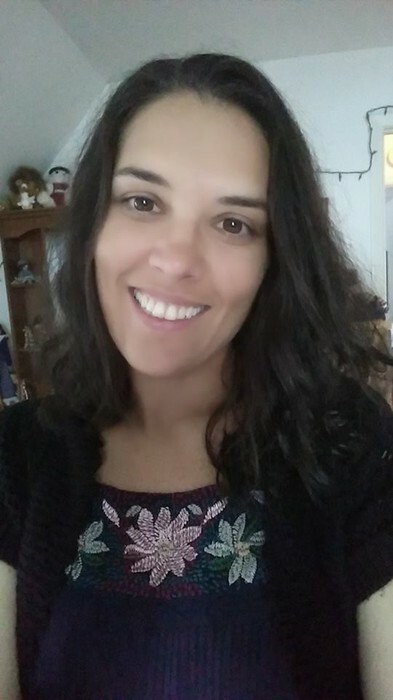 Ms. Walliczek enjoys teaching music at Ravine Drive School and feels blessed to work with such a warm and supportive staff and such eager and willing students.